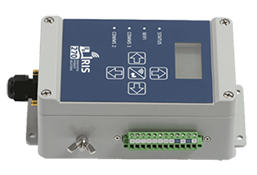 Constructed for use in harsh outdoor and industrial environments, the iRIS 270 offers equal convenience for local Wi-Fi configuration and data download. the compact, cost-effective unit support a wide range of environmental monitoring instruments -- and even up to 50 virtual sensors. LCD display, keypad and memory features support low maintenance demands. Power Supply Internal and/or external 12V SLA battery. Lowest power mode current 7mA. An integral charger accepts a 10-30V DC input. A solar panel can be directly connected to the charger input. Over-voltage and reverse polarity protected with self-resetting fuse. Configure alarm settings for monitoring voltage & charger input. Non-Volatile Storage 32 MB flash memory (nearly 1.4 million samples). A typical site with 2 parameters logged every 15 minutes plus battery voltage logged hourly will give 10 years of storage before data overwrite occurs. Non-isolated RS-232/RS-485 sensor port supports a 2 MP camera.